In Colorado, there are two school bus crashes per day on average, according to an investigation by Kevin Vaughan for KUSA, which appeared on 9News with contributions from Burt Hubbard of Rocky Mountain PBS News. The figure is based on accident data compiled by the Colorado Department of Transportation from January 1, 2011, through June 30, 2015. 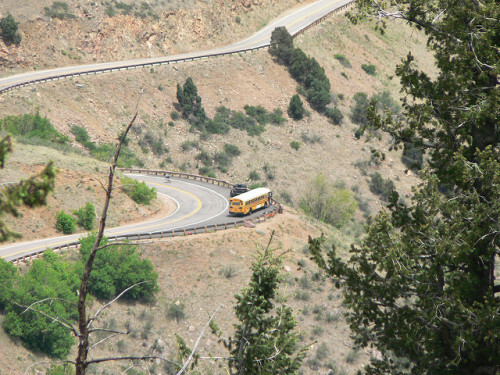 During that period, school buses in the state were involved in more than 1,500 crashes. Figures for the second half of 2015 are expected to be available by late April. Vaughan cited 69 crashes in which the driver was preoccupied or distracted by passengers and 47 cases in which the driver’s inexperience was a major factor. Bad weather played a role in only about one fourth of the accidents. The largest number of crashes involved buses hitting parked cars, but rear-end crashes caused the most injuries. Of all the space around your vehicle, it is the area ahead of the vehicle (the space you are driving into) that is most important. At least a 15-second lead time can help with planning for an upcoming problem. You need space ahead in case you must stop suddenly. According to accident reports, the vehicle that buses most often run into is the one in front of them. The most frequent cause for this type of crash is following too closely. Remember, if the vehicle ahead of you is smaller than yours, it can probably stop faster than you can. It is a very safe mode of transportation, but clearly we need to continue to do everything we can to review the procedures and policies and rules so that it gets even safer. In a related news item, earlier this month Michelle Dillon wrote for The Register-Herald that National Highway Traffic Safety Administration Administrator Mark R. Rosekind said that seat belts save lives. Rosekind was speaking in November at the 41st summit of the National Association for Pupil Transportation. NHTSA’s policy, Rosekind said, is that every child on every school bus should have a three-point seat belt. Dillon’s article referred to a bill introduced in the West Virginia House of Delegates that would require that state’s board of education to install seat belts on all school buses over a five-year period. The bill, H.B. 2582, was introduced in 2015 and reintroduced this January, and then referred to the WV House Committee on Education. According to the National Conference of State Legislators’ website, the only states that have some form of school bus seat belt law are California, Florida, Louisiana, New Jersey, New York, and Texas. Image by Rick Kimpel, used under its Creative Commons license.